Fuseco offers wide range of Arbitrary/Function Generators from GW Instek. GW Instek has been one of the major signal source suppliers for worldwide users by providing the advanced-featured products for decades. The wide product lines including MFG(Multi-Channel Function Generator), AFG (Arbitrary Function Generators), RF Signal Generator, DDS (Direct Digital Synthesized) Function Generators, and Analog Function Generators are well provided. 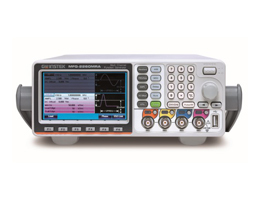 MFG-2000 Series is a brand new product of function generator. The special feature is that you can output maximum for five channels simultaneously. It also has RF Generator and the frequency is from 1uHz to 160MHz/320MHz. The most important is isolated design. Output Channels, synchronization and modulation input/output connector grounding are isolated from instrument chassis. The MFG-2000 Series is designed for scientific research and educational applications by the RF Generator and the isolated design. The AFG-3000 Series is designed for industrial, scientific research and educational applications by the high sample rate and the wide frequency bandwidth. The AFG-2000 and AFG-200 series are designed to accommodate the educational and basic industrial requirements.